17x21 Traffic/Steve Winwood Fantasy Factory Framed Gold Record. 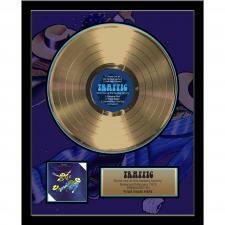 These Gold & Platinum Records are made from laminated vinyl and ultra-high quality metallized Mylar film. These are the same records that you see hanging on the walls of record companies, artist's homes, recording studios and Hard Rock Cafes'.